I was introduced to Sharon Cohen and Breathless Wines through a good friend, Patricia V. Davis. Patricia is an author who I have known for many years. The first book in her latest series, Cooking for Ghosts in The Secret Spice Trilogy is set on board the Queen Mary. 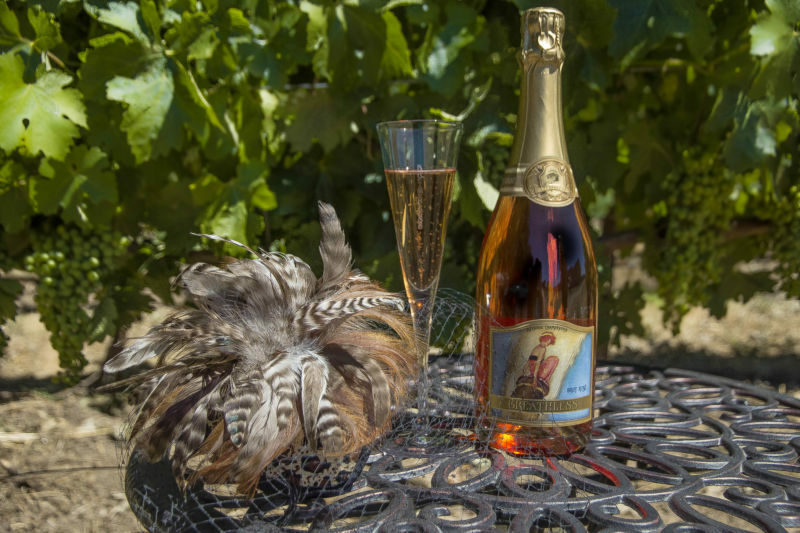 It’s an interesting connection because, like the Queen Mary, Breathless Wines has the spirit and glamour of the 1920s and 30s. It can be seen in their style, their design, and even in their playfulness. Patricia told me that Breathless Wines is special, but I really didn’t get it until my visit. Wine Enthusiast’s 90 point rating on their sparkling wine was not what she was talking about when she said special. It goes far beyond just the quality of the wine. It is the quality of the people she was referring to. The winery was set up by three sisters in honor of their mother, who was a teacher. Their mother passed away of a horrible disease called Alpha 1. It is a genetically inherited defect that causes lung disease in adults and liver disease at any age. The name of the winery comes from their mother, but surprisingly not because she suffered from lung disease. Instead it refers to the way their mother took no breath for granted and all three girls always felt breathless as they grew up chasing behind her. I don’t know about you, but hearing that story just made my eyes water and my heart ache. Sharon Cohen, Rebecca Faust, and Cynthia Faust are the sisters behind the wine. I just love that strong women created these wines together. Each plays an important part in the business. Sharon does the marketing and sales, Rebecca does the crushing and bottling, and Cynthia is in charge of the look and design. Women together can accomplish anything; these ladies are proof of that. Today, Breathless Wines is a big contributor to the Alpha 1 Foundation. 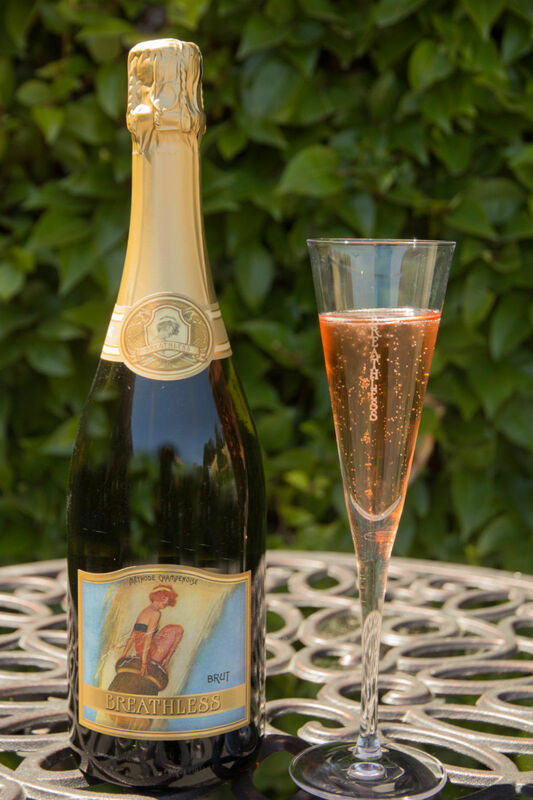 They provide their wonderful sparkling wines for all of the foundation’s events and have the ethos of “giving back” to the community; another thing to love about them. Penny Gadd-Coster is the winemaker and is another very important aspect of the Breathless family. Originally from Jordan, Penny learned her profession not in school, but by working her way from the ground up in wineries; learning her craft hands-on. There are all kinds of exciting happenings at Breathless Wines, including the opening of their brand new tasting room in Healdsburg. They are hoping to open for Labor Day weekend. They chose to be environmentally friendly when building their new facility, and are recycling shipping containers as their new buildings. They have planted beautiful gardens all around the site. I am told there will be a pizza oven and small plate pairings to enjoy, along with the sparkling wine out in the garden area. Their new tasting room will also have fun little props like 1920’s and 1930’s hats, boas, and other things to make your selfies really fun. Sharon also hinted that their might be a photo-booth on the premises. Who doesn’t love that! 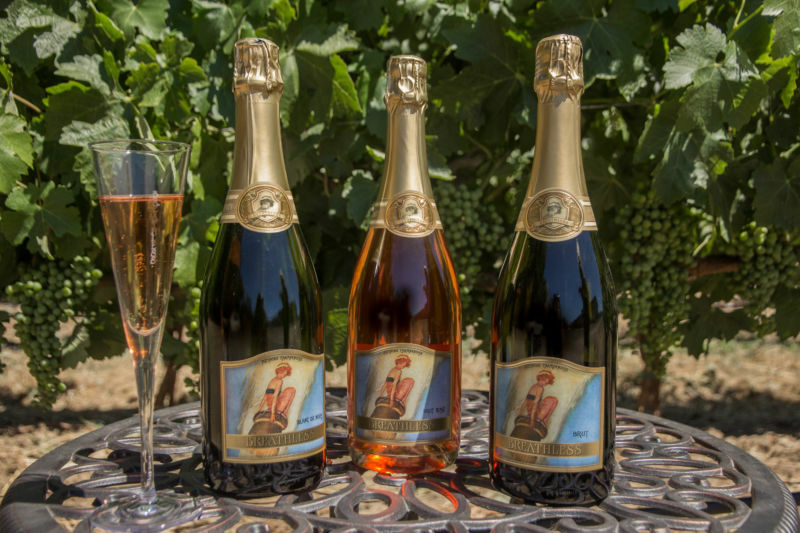 The tasting room fees are a very reasonable $14 per person for a generous tasting of the three sparkling wines. I am told that their wine club has amazing parties and fun events. They have three levels of membership: Ruby, Emerald and Diamond. These commit you to purchasing three, six, or a dozen bottles every three months. That works out at a cost of about $75, $145-$160, or $250-$275 per shipment. These prices don’t include tax or shipping. Of course if you go pick up your bottles, there is no shipping fee. 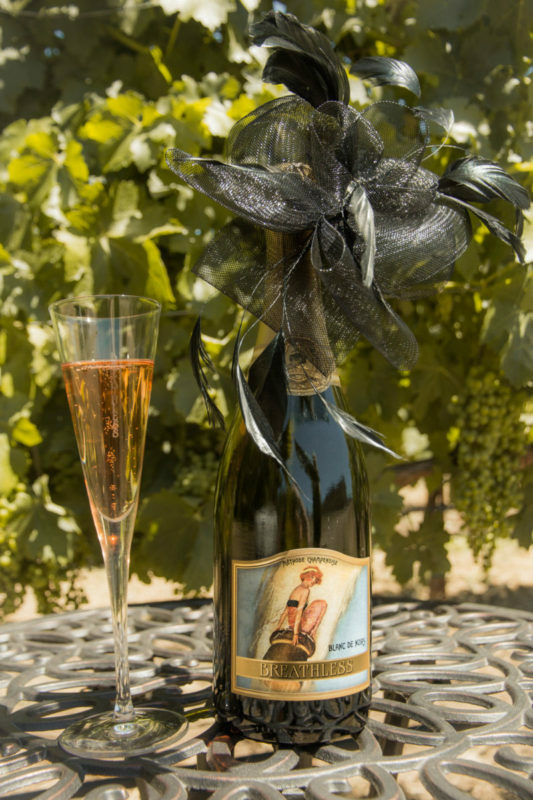 Another one of the really fun things at Breathless Wines is their Sabrage Experience. One of the Breathless team takes your party outside to open your bottle with a real saber! That’s right a sword! How crazy and fun is that? I saw it done and it was awesome! The cost is a very reasonable $30 and you get the champagne to drink. The Brit comments: I have read about this method of opening a bottle and seen it on video. I would love to see it for real. As for their wines, they are delicious. They are made in the traditional Champagne method and are priced at a very affordable level. They offer 3 different styles: The Brut ($25), The Blanc de Noirs ($30), and The Brut Rose ($32). The Brut is a blend of Chardonnay, Pinot Noir and Pinot Meunier. It is light and refreshing although a little on the sweet side. I would say as far as flavor goes, I would liken it to a Demi-Sec far more than to a true Brut. It is soft and a little floral. Very nice for a warm day to be enjoyed with brunch or canapes. 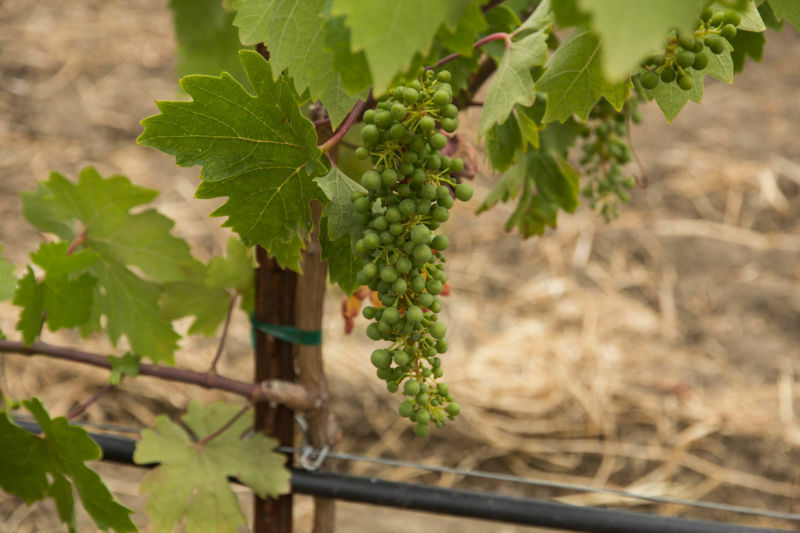 The Brit comments: The Napa sparkling wine houses that we have visited use just the first two of these grapes. French Champagne uses all three. The Blanc de Noir is made from 100% Pinot Noir. It is lively on the palate with a beautiful flavor. There is no yeast there, just all fruit; which is great. Still on the sweet side, but elegant and drinkable. I would pair this with Chinese take out; that sweet and salty mix would be amazing with this sparkling wine. My absolute favorite of the lineup is the Brut Rose. This is the sparkling wine that strikes the perfect balance. I could see myself enjoying this with fish or a cheese plate; the possibilities are endless for this sparkling jewel. The flavor is full-bodied and rich in the mouth. It is 60% Pinot Noir and 40% Chardonnay. It has a beautiful color and a creamy finish. I loved this one so much I had to take some home. It is a total winner for me! This beautiful winery has true heart and soul. We are all looking to do better and be better, but Breathless Wines are truly putting their money and actions where their mouths are. I would highly recommend you visit them on your next visit out to Healdsburg. In the meantime, they have their pop-up tasting room in Geyserville. Cheers!